Shower curtains perform both a functional role in the bathroom by keeping water in its proper place and a decorative role by establishing a stylish aesthetic. But whether you choose a simple plastic curtain to curtail water or a layered, luxury look, the shower curtain is going to need to be cleaned. Shower curtains are exposed to bath soaps, body soil, and lots of moisture and humidity that encourage the growth of mildew. Learning how to wash a fabric, plastic, or vinyl shower curtain properly will extend the life of the product and keep your bathroom environment healthier. How often you need to wash your shower curtain depends greatly on whether you use a vinyl liner and how well the air circulates in your bathroom to help prevent mildew growth. A good rule of thumb is to wash shower curtains at least seasonally. The very first step in cleaning a fabric shower curtain is to read the care label, where you'll find information about fiber content, washing and water temperature instructions, the best drying temperature, and, if needed, ironing tips. You will need to actually take the shower curtain down to get the best cleaning results. As you remove it from the shower rod, check the rings or hooks to see if they need cleaning as well. Most can be wiped down with a damp cloth to remove any dust or soap scum. This is also a good time to check the curtain for any rips or tears that should be mended. Most fabric shower curtains are washed in warm water on the permanent press cycle. By using this cycle, the final spin speed is reduced to help prevent excessive wrinkling. Use a good, heavy-duty detergent like Tide or Persil to remove body soil and soap scum build-up. Add one cup of distilled white vinegar to the washer to help cut through soap scum. If the soap scum is particularly heavy on vinyl curtains, mix equal parts vinegar and cool water and submerge the vinyl for an overnight soak and then wash as usual. Most curtains can be tumble-dried on medium to low heat. Remove the curtains while still slightly damp to prevent set-in wrinkles. Promptly hang the shower curtain and the wrinkles will fall out as they finish drying. Heavy natural fiber shower curtains will often need some touch-up ironing to make seams lie flat and embroidered or monogrammed fabrics can pucker a bit after washing. Follow the care instructions to select the correct ironing temperature for the fabric type. After ironing, rehang your shower curtains. If you have discoloration from mildew and the stains remain after washing, use an oxygen-based bleach and water solution to soak them away. Following product directions, mix enough water and oxygen bleach to completely cover the shower curtain when submerged. Allow the curtain to soak for at least four hours—overnight is better—to remove the stains. Rinse well and dry the fabric. If the shower curtain is solid white and made from a natural fiber like cotton or linen, you can use a solution of chlorine bleach and water. Follow product directions for mixing and only allow it to soak for 15 to 30 minutes because chlorine bleach is more harsh and extended exposure can result in yellowing, holes, or weak fibers. Vinyl shower curtains do an excellent job at containing water inside the shower enclosure. These are most often made of PEVA or polyethylene vinyl acetate or PVC or polyvinyl chloride. Many consumers prefer softer, non-chlorinated PEVA liners because there are concerns about the health effects from fumes that occur when PVC is exposed to heat. Vinyl shower curtains come in a variety of weights and can be used as a liner for a fabric shower curtain that is not water-repellent or can be used as a stand-alone shower curtain. Remove the vinyl shower curtain from the shower rod and carefully check the top header for rips and tears that can easily occur. These cannot be repaired and the curtain should be replaced. Vinyl shower curtains can be cleaned in a washer by using a cold water setting and the gentle cycle. Always add some colorfast towels or t-shirts to the load to help prevent excessive wrinkling. Never place a vinyl shower curtain in a tumble dryer. 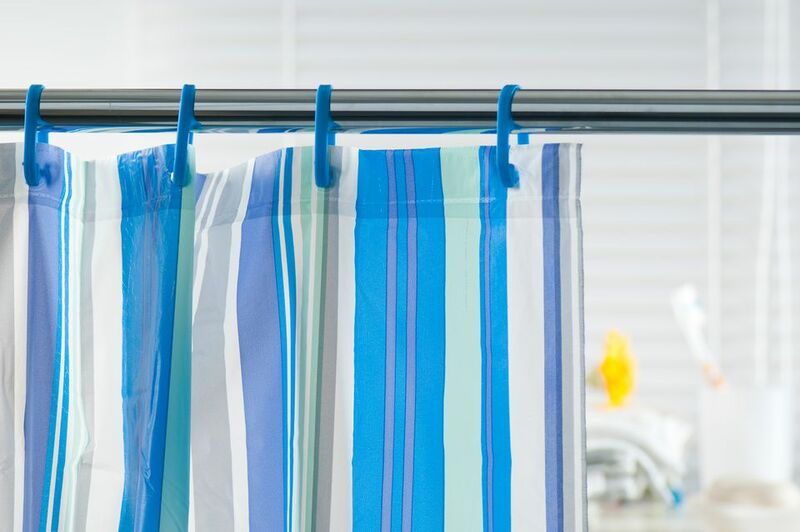 When you remove it from the washer (as promptly as possible to prevent creases), give it a good shake and immediately hang it back up on the shower rod to air dry. Any wrinkles should be gone by the time it dries. If not, the next hot shower will help the vinyl relax and drop the wrinkles. If any mildew stains remain after washing, mix a mild solution of chlorine bleach and water and soak the stained area for 10 to 15 minutes. Use only one-half cup of bleach per gallon of water. Vinyl shower curtains are usually less expensive than fabric curtains and lightweight vinyl liners can be purchased at a dollar or discount store. After several washings or months of use, you may decide to simply recycle the liner into a tarp or drop cloth rather than take the time to clean it.